Santa Clara, California, November 6, 2018 – Crocus Technology Inc., a leading supplier of disruptive Tunnel Magneto-Resistance (TMR) sensors, today announces the CT300 device, a new break-through TMR-based angular (2D) magnetic sensor with an extremely low angular error and high stability over a wide temperature and voltage ranges to address a variety of markets. The CT300 is designed using Crocus’s revolutionary Magnetic Logic Unit™ (MLU™) technology and consists of two full-bridge magnetic resistor networks capable of twodimensional sensing. In the presence of a rotating magnetic field, the CT300 senses the field and produces two sets of differential signals representing the sine (SIN) and cosine (COS) waveforms. Once the differential signals of the CT300 are processed and compensated, the resulting angular error will be at or below 0.5° over a temperature range of -40°C to +150°C. A single CT300 can measure the absolute angle resulting from a full 360° rotation and can sense magnetic fields ranging from 20 mT to 80 mT. The CT300 addresses the demands of the consumer, industrial, medical and automotive markets and is highly suited for applications such as OIS (Optical Image Stabili-zation)/AF (Auto-Focus)-enabled camera modules, optical encoders, BLDC motor control, IoT enabled smart devices and appliances, automation equipment, industrial controls and robotics where precise angular position measurements are required. 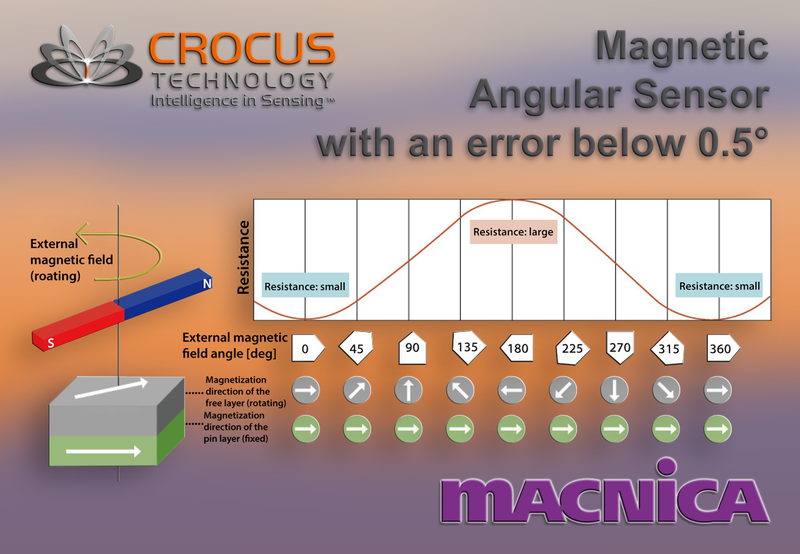 Crocus Technology develops and supplies magnetic sensors and embedded memory solutions based on its patented TMR sensor technology, the Magnetic Logic Unit™ (MLU™). Crocus’s magnetic sensors bring significant advantages to industrial and consumer electronic applications requiring high sensitivity, stable temperature per-formance, low power and low cost. Crocus is headquartered in Santa Clara, California and has offices in Grenoble, France and Beijing and Shenzhen, China. For more in-formation, please visit www.crocus-technology.com. © 2018 Crocus Technology International Corp. All rights reserved. Crocus Technology, MLU, and combinations thereof are trademarks of Crocus Technology Inc. and Crocus Technology SA. Other names are for informational purposes only and may be trademarks of their respective owners.